Despite some resistance from traditional treatment providers, medications are being integrated into addiction treatment, and social workers are at the forefront of understanding why this is an important development. Hazelden is one of the best-known addiction treatment organizations in the nation, and its historical approach to treatment has focused on a combination of abstinence and the 12-step program. In fact, the Minnesota Model of treatment adopted by Hazelden several decades ago has become widely used throughout the United States. But even the most traditional of organizations sometimes find themselves in situations where they must evolve. Such was the case a few years ago at Hazelden, which was faced with a national epidemic of opioid abuse and the realization that it was getting harder to successfully treat its own patients. Patients were bringing medications of abuse into Hazelden facilities, leaving before treatment was completed, and relapsing and dying of overdoses after treatment. “With those sorts of episodes occurring, we knew we had to do something different,” says Marvin Seppala, MD, Hazelden’s chief medical officer. Hazelden responded in 2012 by developing its Comprehensive Opioid Response With the Twelve Steps program (COR-12), which offers patients the opportunity to receive buprenorphine and naltrexone as part of their treatment regimen. The sea change at Hazelden is only one example of a trend toward greater use and acceptance of medication-assisted treatment (MAT)—a trend fueled by growing concern over opioid abuse and the push for greater integration of primary care and behavioral health services. Observers say social workers have a leading role to play in making sure MAT is used effectively and ethically. • Methadone: It is one of the oldest medications to treat opioid addiction and is a full opioid agonist, which means it fully activates opioid receptors to suppress withdrawal, block the effects of other opioids, and reduce craving. This medication must be taken every day and, because it has a high potential for abuse, it is only available through licensed opioid treatment programs. • Buprenorphine: This medication is a partial opioid agonist approved by the FDA in 2002. It has a lower risk of abuse, dependence, and side effects compared with methadone. It can be prescribed by a certified physician, thus eliminating the need to visit specialized treatment clinics. Buprenorphine often is offered as a combination medication with naloxone, which reduces its potential for abuse. • Naltrexone: This is used for the treatment of opioid dependence and alcohol use disorders. As an opioid antagonist, naltrexone blocks the effects of opioids and has demonstrated effectiveness in reducing alcohol consumption, the effects of alcohol, and cravings for alcohol. Because patient compliance can be an issue with naltrexone, the FDA has approved Vivitrol, an injectable form of naltrexone that is administered monthly. • Acamprosate: This medication normalizes alcohol-disrupted brain activity and thus helps reduce cravings for alcohol and withdrawal symptoms. It was approved by the FDA in 2004 for use in treating alcohol use disorders and is also known by the brand name Campral. • Disulfiram: Commonly known by its brand name, Antabuse, disulfiram was approved by the FDA in 1951. It is an aversion therapy that works by blocking alcohol breakdown in the liver, which makes a person violently ill if he or she consumes alcohol. Disulfiram also is being studied as a treatment for cocaine dependence. Medications also are used in the treatment of tobacco dependence, including nicotine replacement therapies such as the nicotine patch and nicotine lozenges, as well as bupropion (Wellbutrin and Zyban) and varenicline (Chantix). There are not any FDA-approved medications for the treatment of stimulant abuse, such as with cocaine and methamphetamine, although research and clinical trials continue (McIntosh, 2010). For example, researchers are testing a vaccine that triggers the immune system to create antibodies to block the effects of cocaine. Despite research demonstrating MAT’s effectiveness as an evidence-based practice, such treatment remains underutilized. For example, less than one-half of the 2.5 million Americans aged 12 or older who abused or were dependent on opioids in 2013 received MAT (Volkow, Frieden, Hyde, & Cha, 2014). There are several factors suppressing the use of MAT (Roman, Abraham, & Knudsen, 2011). Treatment programs and providers that support a 12-step approach to recovery as well as individuals who don’t have access to prescribing physicians are less likely to support and adopt MAT. Another barrier is the lack of guidance to treatment providers about selecting patients best suited for MAT and how to integrate it into the overall operations of a treatment organization as well as how to best match MAT with supportive counseling. Finally, MAT use might be higher if clients and potential clients of treatment services knew about the medications and requested them. 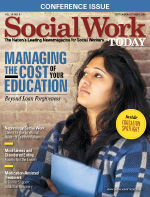 Despite these obstacles, there are signs that many social workers are more open to using MAT than other types of addictions professionals, says Brian Bride, PhD, MSW, MPH, at the School of Social Work at the University of Georgia. Bride was part of a research group that specifically studied social workers’ attitudes toward MAT. The researchers examined data from a study of 345 privately funded, community-based treatment centers and found that social workers tended to have more positive attitudes toward MAT and were more open to their use than other counselors. The authors speculated these results may be due to social workers’ exposure to evidence-based practices, including MAT, through their professional education and their orientation toward addressing clients’ biopsychosocial needs in a team treatment approach that includes medical professionals (Bride, Abraham, Kintzle, & Roman, 2013). MAT use in addiction treatment programs will likely increase as more professionals become aware of it and accept it as an evidence-based practice, Frost says. And even professionals who continue to have philosophical reservations about MAT may find that two external factors—the opioid abuse epidemic and the greater integration of primary care and behavioral health—will compel them to adopt MAT. Opioid abuse, primarily of prescription pain medication, has gained an ever-increasing amount of media attention in recent years as the scope of the problem becomes bigger than many treatment providers’ and policymakers’ ability to address it effectively. In this environment, treatment professionals need to use every tool at their disposal, including medications, to help addicts, Seppala says. In addition, many observers believe the Affordable Care Act will increase connections between physical health care and mental health care, including addictions. Often called the person-centered health care home, this integration can take various forms, including colocating medical and behavioral health providers and assembling a health care team, which includes primary care and behavioral health professionals, for a patient. This trend may lead to a push for increased medicalization of substance abuse services, including MAT use, says Andrews, who is part of a study exploring how the Affordable Care Act will affect substance abuse treatment. One possible manifestation of this phenomenon is that more traditional medical care and mental health care providers will begin offering treatment services because they already have the infrastructure in place to prescribe medications and monitor their use, she says. Stigma is a real concern for people in recovery who use MAT. For example, part of Hazelden’s COR-12 program involves what Seppala calls “stigma management.” The organization identifies Narcotics Anonymous meetings that will accept people who are taking buprenorphine. Traditionally, some of these meetings have restricted the participation of people using MAT. “We try to find meetings that are really accepting of medication so our patients are supported in their recovery,” Seppala says. Despite their agreement that there should be more acceptance of people using medications as part of their recovery, some observers are concerned that many people will see these medications in the same way as psychotropic medications—as wonder drugs that eliminate the need for talk therapy and psychosocial support. “A lot of people want to take something and move on and don’t want to address the underlying issues that may be contributing to the problem,” says Ann Abbott, PhD, LCSW, ACSW, NASW past president and an NASW expert on addiction. Abbott says social workers have an ethical responsibility to be knowledgeable about MAT, to stay up-to-date on MAT trends, and understand the role various mental health factors play in addiction. Social workers in a team environment with other addictions professionals also need to realize that other professionals may have different ethical standards and think about how they are going to work with these professionals without compromising the principles of the NASW Code of Ethics. Social work education programs must ensure they are providing enough instruction on pharmacological approaches to substance use disorders, Bride says. Abbott believes all social work students, no matter their professional interests, should be required to take courses about substance abuse and mental health or choose to take these courses on their own. “Given the current trends in society, [social workers in the field] are going to run into people who are users or who have family members affected by addiction,” she says. Bride, B. E., Abraham, A. J., Kintzle, S., & Roman, P. M. (2013). Social workers’ knowledge and perceptions of effectiveness and acceptability of medication assisted treatment of substance use disorders. Social Work in Health Care, 52(1), 43-58. McIntosh, L. (2010). Medication-assisted treatment part 3: Tobacco and other stimulant dependence. Northwest Frontier ATTC Addiction Messenger, 13(3), 1-3. Volkow, N. D., Frieden, T. R., Hyde, P. S., & Cha, S. S. (2014). Medication-assisted therapies: tackling the opioid overdose epidemic. The New England Journal of Medicine, 370(22), 2063-2066. Deaths by drug overdose have increased steadily during the past two decades, and 113 people die each day in the United States due to a drug overdose, according to the Centers for Disease Control and Prevention (CDC). And while many people associate drug overdoses with celebrities like Philip Seymour Hoffman and Cory Monteith or street addicts, the overdose epidemic affects people from every strata of American life. More than one-half of overdose deaths in 2011 were related to pharmaceuticals, primarily prescription opioid analgesics, according to the CDC. In response to this troubling trend, public pressure is mounting to make it easier to access naloxone (Narcan), a drug that counteracts the effects of opioid overdose. Naloxone is an opioid antagonist that displaces opioids from receptor sites in the brain, thus reversing the depression of the central nervous and respiratory systems that usually causes overdose deaths. Naloxone can be injected into a muscle or vein or sprayed into the nose. A positive response to naloxone can begin within three to five minutes after administration, providing a window of opportunity to get the overdose victim further medical attention, according to the Substance Abuse and Mental Health Services Administration (SAMHSA). Naloxone has long been used by emergency medical personnel to treat opioid overdoses, but pressure is mounting to make it more widely available to first responders, family members and friends of opioid abusers, and even addicts themselves. In April 2014, the FDA approved Evzio, a handheld injector that allows the user to rapidly deliver naloxone, similar to how an EpiPen delivers epinephrine to someone experiencing a life-threatening allergic reaction. Naloxone is not without controversy. An overdose victim treated with naloxone may experience unpleasant opioid withdrawal symptoms, and some detractors argue that naloxone encourages addicts to continue to abuse opioids. But the alternative of not doing anything at all guarantees that more people will die from drug overdoses, says Michael Frost, MD, medical director at Eagleville Hospital, a treatment facility in PA. “[Naloxone] could be the difference between life and death for a person,” he says. For more information about naloxone and opioid overdose, visit SAMHSA’s Opioid Overdose Toolkit at http://www.samhsa.gov.